Thanks for the reply on the top speed. I was just curious what the high torque motor topped out at. 14.2 is pretty good considering the torque you have now. You may have already but if not I'd change ALL the cables to a minimum of 4 gauge welding cable with quality crimped/soldered ends. Hot Rod, you are reading my mind! I just got a box in the email yesterday with 2 awg cable, solder lugs and solder pellets, and adhesive lined shrink sleeve. I wanted to get some baseline readings before I made anymore changes. I still need to get full load amps and volts pulling that long hill. You'll notice a difference right away with the bigger cables. When I changed mine I got a little increase in torque and they don't even get warm. My wife stole mine to water some plants on the other side of property Saturday. But she really never had a problem with it. I just bought a Club Car Precedent over Memorial weekend with the intention of selling one of my EZGO's. Now my wife says keep all 3. I think she has more of a golf cart addiction problem than I do. Thats great. My wife won't have a problem as logs as her SUV has a place in the garage. Are all of your carts Elec? Yes all 3 of my carts are electric. We have a summer place in a gated community and they only allow electric golf carts and boats. From my short experience unless you are running nonstop all day or want a much higher speed I can not see why anyone would chose gas over elec. I have a family member that has a tourists attraction in Pa. and they have several Bad boys which I think are EZ goes. (Gas) These are used by the grounds keepers and are quite fast and are used 8 hrs a day. They run completely out of power on steep grades. I also noticed how easy they seam to steer almost as if they have power steering. Very sensitive ! Hard to control the steering at high speeds.. Any suggestions? Why don't you start a thread about that. I've been away from the forum for a while, but still enjoying the heck out of the old 36v club car. A buddy of mine is crazy into electric vehicles, and has a Chevy volt car. He is also a very serious bicycle rider, and has made himself an electric bike. To make a long story short, I was so intrigued by his success, that I have collected almost all the materials to ditch all the electricals of the old 2002 Club Car DS with V-glide, and convert it to Lithium battery power. The batteries of choice are from a Nissan Leaf. The Nissan Leaf has 48 battery modules of 66AHr at 8Volts DC each. I will be using 7 of the modules for a fully charged voltage of 56 volts. The 7 modules cost me about $600. Even though the AHr is slightly less than a regular golf cart battery, these batteries have no problem being drawn to 20% of capacity, time after time, and still lasting for thousands of re-charges. 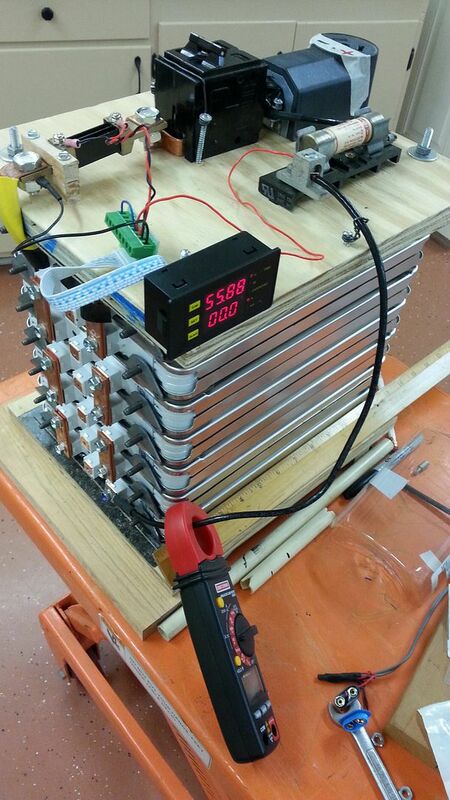 Here's a picture of the test set-up I have for checking the capacity of the Lithium Ion batteries. The whole 56 Volt pack weighs only 70 pounds and measures about 10" x 12" x 13". This conversion offers several advantages (in my opinion anyway, LOL) over keeping and/or replacing the standard Lead-Acid batteries. 1) Cost is no greater than a replacement of lead acid batts. 3)70% savings in battery space. 4) 300 POUND WEIGHT SAVINGS ! 5) This conversion is going to be a LOT of fun! Hot Rod, I've got a few questions I hope you can answer. I plan on doing the conversion this winter and want to do a thread about it. Should I document it in this thread, or start a new thread. Have many people done this conversion? I don't want to re-hash old news. First off let me say I'm looking forward to seeing and hearing about this conversion. I would say start a new thread beginning with your last post or something similar. Go into as much detail as possible and post a lot of pictures on the conversion. Thanks for the response. I can hopefully start a new thread tonight for this crazy endeavor! No problem and thanks for posting the information on doing the Lithium battery conversion. I'd say start the new thread in the Electric Golf Cart High Voltage Conversion section of the forum. Looking forward to see how it works out for you. but the project is stalled for the moment as I finish up other obligations. It WILL be finished before it warms up this spring.